A fire that's deep inside me. Change is coming my way. Ain't nothing that's ever gonna stop me. Show 'em what I'm made of. 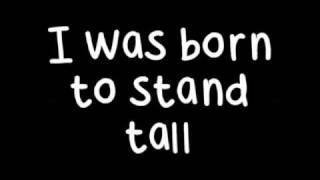 I was born to stand tall. I'm goin' all the way. I can feel it, I believe it. I'm here, I'm here to stay. This world will belong to me.